Lily's Ink Pad: Always Mojo! Today, I saw my first robin. BamBam the cat was sitting in the picture window looking out and I realized that there was lump in the bush...a robin. Spring must really be coming! I also took this picture last Sunday in my flower garden at home. A sure sign! The other sure sign Spring is around the corner is the way the middle schoolers I teach have been acting. Whew! Love, fiestyness, forgetfulness, craziness, tiredness....you name a -ness, they have it! 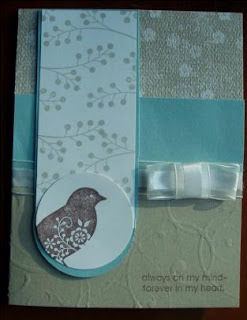 Accessories: 1 3/4 circle punch, Circle Scissors, 5/8' organza ribbon, Stampin' Up! Backgrounds 1 Texturz Plates, Big Shot, Multipurpose pad, silicone pad, and crease plate. 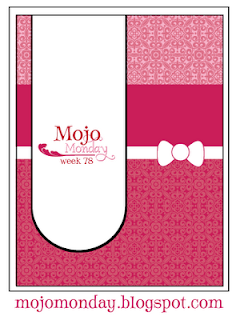 The sketch came from the Mojo Monday Card Sketch blog. I love the sketch. I had this idea floating around and tonight just couldn't get it all the way to my vision, but I am using limited supplies and away from my stamp room. I set up temporary camp in Carmen's front room and this week have a lot of stuff due to my crop Saturday, but since I forgot my ink pads, life got challenging when creating today! It's amazing how handy owning them all is! 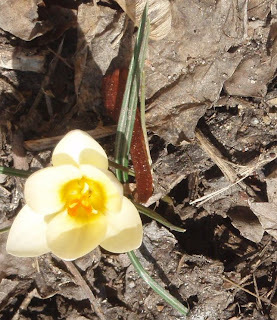 Enjoy your first days of spring! Pretty flower and card - great job on that challenge... I love the Always stamp set and really like every card or project that I see - it's so versatile!